Travel or parlor banjos are smaller than traditional banjos. They have a slimmer profile, shorter neck, and they’re lighter compared to other banjos. Parlor banjos ended up with that name because they were meant to be played inside people’s homes. This was at a time when there were no radios or television. Families often played instruments and sang to entertain each other. 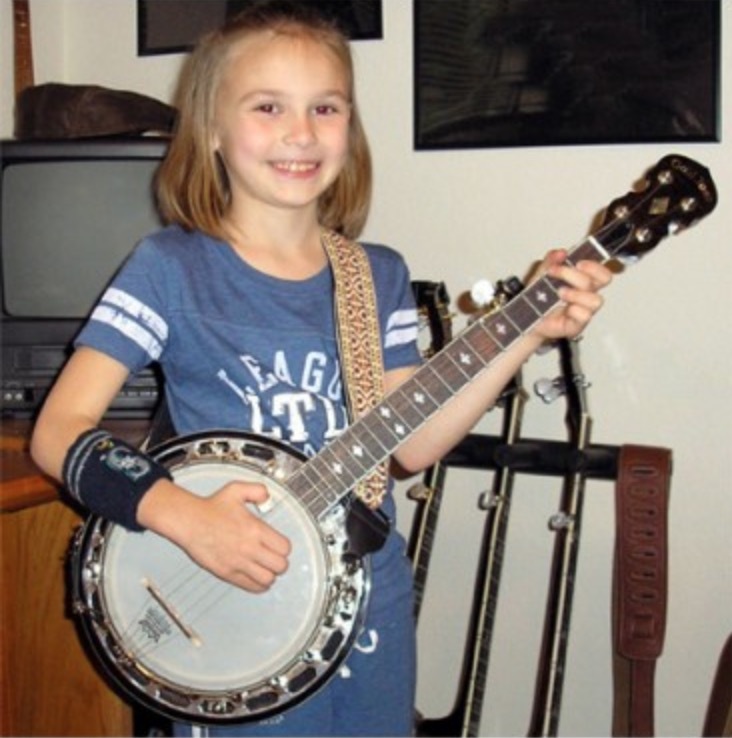 The travel banjo is also a great instrument for children who want to learn to play. Their little hands and arms don’t have to struggle with a big fret. This beautiful banjo has a Fiberskyn head that will make it feel as if you’re learning on an instrument that was around in the day when parlor banjos got their name. It’s a great first instrument for children who are learning. Along with the retro head, the banjo has a lovely satin mahogany finish offset by shiny chrome bits. We love that this banjo comes with it’s own padded gig bag. It’s one that has two straps, so it can be carried like a backpack. The banjo is light and compact for traveling, too. 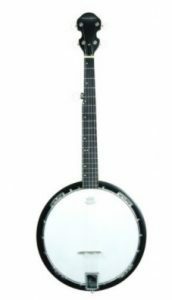 You can toss this banjo into its bag, slip your arms into the straps, and carry this through the woods to your campsite quite easily. While many banjos are lovely to look at, this banjo has a unique style and color unlike the others. Like the company name suggests, it’s a gold tone color that is flashy and cool. You’ll feel like a rock star plucking on this banjo in front of friends or relatives. 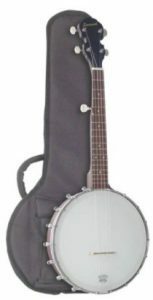 This open-back banjo is light as air, and you can use the included bag to bring this banjo with you everywhere. If you want a travel banjo that can be taken out into the woods to play around a campfire, this is perfect. It does equally well as a banjo that you can take on your next plane trip on vacation. This parlor banjo is detailed with beautiful inlays that are mother of pearl. The wood is maple with a deep, rich finish. The adjustable truss rod ensures that you can make adjustments as you see fit. The SS-10P is a banjo that is designed for open C tuning. With a change of strings, though, you can tune it to open G if you like. This is a terrific banjo for travel or beginners. With the lovely design and slim profile, this instrument is perfect when you want to take a hike through the woods to your campsite without breaking your back. The scale of this lightweight banjo is 19-3/4 inches. It’s made from beautiful woods that are known for their tone. 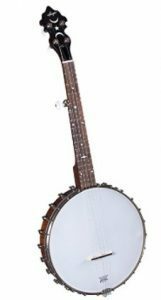 The maple rim, mahogany neck, and the rosewood fretboard are great features of this travel banjo. This parlor banjo weighs about 8 pounds, which makes it a great weight and size for traveling. You can easily bring this banjo on a plane if you wanted to enjoy your music while on vacation. Many semi-professional musicians find that a smaller banjo makes more sense on the road, too. If you have a love for banjos, you’ll want to bring yours with you everywhere you go. From vacation to camping trips to jam sessions at a friend’s house, this banjo will travel very well. It comes with a deluxe padded bag, too. This banjo is a perfect size and weight for a child who wants to learn the banjo. Anyone who has never played the banjo before will enjoy the fact that it’s not a bulky, hard-to-hold instrument. We had to place the Drifter on our list of the top 5 travel banjos because it’s beautiful and easy to carry. 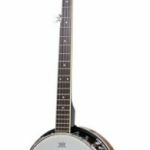 Whether you call it a travel banjo or a parlor banjo, it’s got to be a lightweight instrument that is shorter than traditional banjos. The slimmer profile and light design make it simple to bring this banjo with you everywhere. These banjos are fantastic for showing off as you play for friends and family. They’ll love watching you play your travel banjo at family gatherings or on vacations. If you are just starting out, here are some great banjos for beginners to try!